Powderhounds, I hear you, the itch is real and all we want to know is when the next storm is coming and how much it will bring. Let’s face it though, there haven’t been too many bluebird days so far this winter with all the storminess, and today was very much appreciated! Folks were absolutely getting after the slowly stabilizing backcountry today, and boy was it good. Creamy turns and fast groomers were the rule at the resorts today, and who doesn’t love that. Gorgeous mountain views of the Salt Lake Valley and beyond. Note the layer of haze hanging out near the surface at the top of the boundary layer. I think the best way to sum up where we’re at right now is the time-height forecast for the next few days. 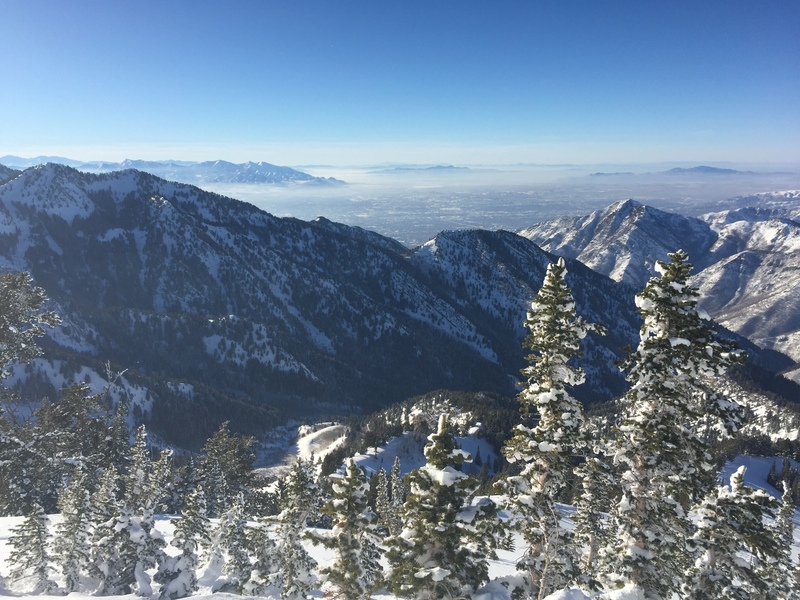 Low-level moisture lingering in valley locations will provide fuel for ongoing partial cloud cover and glimpses of undercast – if you were keeping a keen eye in the mountains today, clouds were lapping up against the Wasatch on the eastern side of the valley on and off today. Unfortunately, we also note a fairly stable boundary layer, which will allow air quality to deteriorate over the next few days. As always, do your best to carpool up to the mountains. NAM 12-KM Time-height diagram for KSLC highlighting low-level moisture, a stable layer at mid-mountain elevations, and copious dry air aloft. As Pete mentioned, we’ll be on the downstream (eastern) edge of the ridge that is building on the western North American coast, which has its benefits. We won’t see as strong subsidence and thus as strong of an inversion as we might otherwise, and weak shortwave troughs may travel through the flow and at least help keep us somewhat ventilated (though these are unlikely to bring snow). Towards the latter half of the week, things begin to look a little more interesting, but for now I’m not going to get worked up about it. Enjoy the sunshine folks, have a great day out there tomorrow, and as Baz Luhrmann once said… wear sunscreen.